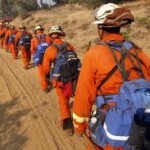 A California Men’s Colony inmate firefighter on a routine training hike collapsed and died Tuesday at Camp San Luis National Guard Base, according to a Cal Fire press release. The man, whose name has not been released pending notification of relatives, passed out at about 3:45 p.m. and was taken to a local hospital, where he was pronounced dead. He had been assigned to the Cuesta Fire Camp at the California Men’s Colony. Cal Fire and the Men’s Colony officials are conducting an investigation. I very much appreciate the headline used here. Good for Cal Coast News. I’ve run into crews of these young men several times while on solo remote hikes and have been treated with great respect. My heart goes out to his family. I don’t know very much about the fire camp program but I’m pretty sure that it’s a privilege that some inmates can apply for on good behavior and/or when they’re servicing a relatively short term. I’ve heard that they actually serve as volunteers later when there is a need like a serious forest fire. Does anyone know about this program? It sounds very positive. My condolences to his family and those who loved him, rest in peace. Anyone training to be a fireman is a hero in my book. Condolences to this young man’s friends and family. Very sad.